Summary of today’s show: Pope Benedict XVI shocked the world with his announcement that he would resign the See of St. Peter later this month. Scot Landry talks with a panel of guests—Fr. 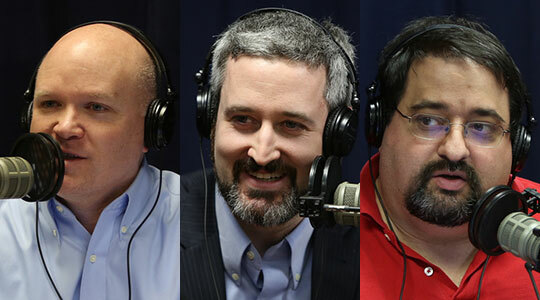 Roger Landry, Domenico Bettinelli, Chris Kelley of WQOM, and Rocco Palmo of Whispers in the Loggia— about the implications of this unprecedented action, what it means for the near-term future of the Church, and the legacy that the Holy Father leaves behind. 1st segment: Scot welcomed Rocco Palmo to the show. Rocco talked about how he first heard about the news of Pope Benedict’s resignation, being woken this morning by his mother to the surprise news. He noted that there’s a lot of talk about names today, but the cardinals he’s talked to today have been too stunned to even process this event. Scot asked Fr. Roger Landry for his reaction. He said Pope Benedict XVI talked about he’d prayed about this very much. This isn’t an abdication of his responsibilities, but another Yes in a lifetime of Yeses by Joseph Ratzinger. The Pope is trying to say that with the amount of time has left in the morning is that he’s prioritizing prayer even more than the responsibilities of the papacy. It’s a lesson about just how important prayer really is for all of us. Scot said today is the Feast of Our Lady of Lourdes, the World Day of the Sick, and anniversary of the signing of the Lateran Accords. Rocco said all three have significance today. The Lateran Treaty was signed in 1929 with Italy that made the Vatican a sovereign and neutral entity and guaranteed the pope temporal freedom. He said over the last several months the Pope has been noted as becoming ever more frail. He thinks the Pope was keen not to put the Church in a state of suspended animation again. The last years of John Paul were very moving, but Benedict saw himself as a transitional pope and to do things in a quiet way. The modern papacy outlives the demands the papacy puts on the officeholder’s body. He doesn’t believe that John Paul could have done this, but Benedict will be entering a cloistered monastery behind the Vatican walls. Before his election in 2005 he had wanted to retire to his home in Germany and write books. Scot asked Fr. Roger what to make of the comparison between John Paul at the end of his life and Benedict at the end of his. Fr. Roger said they were both saying yes to what was being asked of them by the Lord at the time. Benedict isn’t running away from the cross at all. He’s embracing it. There is a lesson of what the pope is capable of doing by his own presence. Think of an 85-year-old doing 12-14 hours per day, not to mention the grueling work of Holy Week and Easter in seven weeks or the international travel to World Youth Day. Rocco said it is a fact that the cardinals didn’t know. The pope had a little noticed meeting on Friday with Cardinal Angelo Sodano, the retired Secretary of State, and the Dean of the College of Cardinals, who leads the Church until a new pope is elected. He won’t participate in the conclave because he’s over 80 years old. Rocco has talked with a bishop who was in the room at the Vatican when the Pope made the announcement in Latin and how stunned everyone was. Rocco said this is unprecedented and so much of what happens when a pope dies isn’t going to happen. We don’t know what his title will be nor what his prerogatives. He noted that this shows his humility in not calling a press conference, for instance. He wants to be remembered through his recent books for helping to bring simple people to faith, not writing deep theological treatises. He noted that Benedict is older than John Paul was when he died by two years. I have convoked you to this Consistory, not only for the three canonizations, but also to communicate to you a decision of great importance for the life of the Church. After having repeatedly examined my conscience before God, I have come to the certainty that my strengths, due to an advanced age, are no longer suited to an adequate exercise of the Petrine ministry. I am well aware that this ministry, due to its essential spiritual nature, must be carried out not only with words and deeds, but no less with prayer and suffering. However, in today’s world, subject to so many rapid changes and shaken by questions of deep relevance for the life of faith, in order to govern the barque of Saint Peter and proclaim the Gospel, both strength of mind and body are necessary, strength which in the last few months, has deteriorated in me to the extent that I have had to recognize my incapacity to adequately fulfill the ministry entrusted to me. For this reason, and well aware of the seriousness of this act, with full freedom I declare that I renounce the ministry of Bishop of Rome, Successor of Saint Peter, entrusted to me by the Cardinals on 19 April 2005, in such a way, that as from 28 February 2013, at 20:00 hours, the See of Rome, the See of Saint Peter, will be vacant and a Conclave to elect the new Supreme Pontiff will have to be convoked by those whose competence it is. Dear Brothers, I thank you most sincerely for all the love and work with which you have supported me in my ministry and I ask pardon for all my defects. And now, let us entrust the Holy Church to the care of Our Supreme Pastor, Our Lord Jesus Christ, and implore his holy Mother Mary, so that she may assist the Cardinal Fathers with her maternal solicitude, in electing a new Supreme Pontiff. With regard to myself, I wish to also devotedly serve the Holy Church of God in the future through a life dedicated to prayer. Scot said it’s a moving and personal message to the cardinals gathered there and to the worldwide Church. Fr. Roger what stands out for him about consulting the Lord in his conscience repeatedly. He thinks the phrase “to govern the barque of St. Peter and proclaim the Gospel” is significant because how much work it takes to do all that including, proclaiming the Gospel throughout the world. We all feel a bit of a kick to the gut. But we need to remember that it is Christ’s Church and that we have a King and High Priest who never leaves us. Scot talked about the practice of bishops who resign and retire from the dioceses, while in Rome, the Pope doesn’t generally retire. Fr. Roger said it used to be that once you were a bishop, you never resigned, but with the advance of medicine you had the phenomenon of men living well into old age where they could not serve effectively. That’s why the Code of Canon Law implemented mandatory resignations at 75, the pope exempted. It was always foreseen that the Pope could resign. Scot welcomed Chris Kelley to the show. Scot said this is a humble act by the Holy Father. Chris said the humility of this pope, we’ve seen from the beginning of his pontificate and even before. We see it in his first encyclical, for example, Deus Caritas Est, God is Love. He has a great way of breaking down theological concepts into every day speech. Chris noted that it was in his preaching that Benedict seemed most alive and youngest. Scot said he was most shocked today, not about the resignation, but that he resigned with two weeks notice, having just launched a major Twitter initiative, in the middle of the Year of Faith, and with his next great encyclical on Faith unpublished. Some speculate that there is some health crisis that precipitated such a short period between his announcement and resignation. Fr. Roger said the Pope knows a long lame duck session would make things worse. He likely saw the grueling Lent and Holy Week coming up as well as World Youth Day and saw that he could not fulfill them. He talked about the eyewitness of people in the room when the Pope made the announcement and they felt Cardinal Sodano had been prepared for the announcement. Dom talked about the ability to go to the Catholic media versus the secular media which is often cynical and ill informed and looking for scandal and conflict in their coverage. Fr. Roger said on our part we can live our faith more fully and when we do, we don’t approach this as a massive crisis for which there is no answer. He said whoever is elected will have big shoes to fill and will need all the prayers of the Church. The world needs most from the Church is that we’re not looking at it in terms of political ideologies or that the next pope will be chosen based on nationalities, but instead we’re basing our talk on what really matters. We need to assure others to have faith in Christ. “The Catholic community and the world today learned that Pope Benedict XVI, following deep prayer and reflection, announced that he will resign the papacy at the end of this month. We join the universal Church in offering prayerful gratitude for the Holy Father’s faith, courage and his leadership as the successor of Peter. At this time it is appropriate for the Church and all people of good faith to reflect on Pope Benedict’s legacy and achievements. He brought unique capabilities to the papacy as a highly qualified scholar and teacher, and as Prefect of the Congregation for the Doctrine of the Faith, in service to Blessed John Paul II. His fidelity to maintaining the truth and clarity of the Catholic faith, to cultivating ecumenical and interfaith dialogue and in reaching out to inspire the next generation of Catholics have been great gifts to us all. It was a great privilege for me to be present as Pope Benedict met with survivors of clergy sexual abuse during his visit to the United States in April 2008. At that meeting the Holy Father’s pastoral care for the survivors was clearly evident, as was his commitment and determination to heal the wounds of all persons impacted by the abuse crisis and to insure that the Church continues to do all that is possible to provide for the protection of children. Chris talked about the legacy he’ll remember from Pope Benedict in the future. He said the Year of Faith is a time to learn more about the Petrine ministry. Dom talked about the Pope’s legacy as the “new media” Pope. Fr. Roger described how the conclave works and why we trust that the Holy Spirit works in the election of the Pope. All the cardinals under 80 will gather in the conclave. Those over 80 can come to Rome and participate in consistories before the conclave. Those meetings will discuss the challenges facing the Church in the world today, led by Cardinal Sodano. He will lead a Mass to begin the conclave in which they will be locked in the Sistine Chapel and begin a process of two votes per day. They will pray for the guidance of the Holy Spirit as they make their selection from among their number. He said it took courage to elect Benedict with the unfair reputation of the German Rottweiler and to elect John Paul, an unknown from Poland. The Holy Spirit gives the gift of courage. Scot said the Pope won’t vote in the conclave and there’s question as to what he will be called. Fr. Roger said the Vatican said today that he will be called Bishop-emeritus of Rome. The successor will have big shoes to fill and will clearly consult him. Pope Benedict is clearly saying that in order to be Pope and you need to be physically vigorous. We need someone of profound faith, someone who speaks English, Italian, Spanish, and French at least, and someone who’s physically healthy. He encourages everyone to pray for Pope Benedict, for the cardinals, and for his successor.